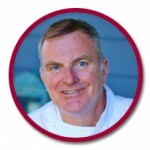 Peter started with Hammond Care in 2012, after five years as Head Chef at the Art Gallery of NSW. He was also head chef of the Sydney Opera House and other career highlights include working in the palace kitchens for the Royal Family, managing 120 chefs on-site for Wimbledon Tennis Championships and cooking in top restaurants in Bermuda, Germany and London. He has also cooked in some of Sydney’s most iconic restaurants such as Gay Bilson’s Bennelong, the three-hat MG Garage and his own one-hat Clock Hotel Restaurant. Now he brings to the aged care sector his vast restaurant experience along with his passion for fresh, seasonal and sustainable produce as well as innovation in modified meals and the dining experience for people living with dementia. Peter has co-written a book on food innovation, recipes and strategies for food for people living with dementia. It will be published in June 2014. Why I'm involved in The Lantern Project? It is so positive to meet like-minded professional people all with the common goal, to raise awareness on the importance of good unadulterated food and good nutrition for the older person; with the goal to make a difference. Peter started with Hammond Care in 2012, after five years as Head Chef at the Art Gallery of NSW. He was also head chef of the Sydney Opera House and other career highlights include working in the palace kitchens for the Royal Family, managing 120 chefs on-site for Wimbledon Tennis Championships and cooking in top restaurants in Bermuda, Germany and London. He has also cooked in some of Sydney’s most iconic restaurants such as Gay Bilson’s Bennelong, the three-hat MG Garage and his own one-hat Clock Hotel Restaurant.